A nautical Nemeziz headlines the first adidas on-pitch collection of the upcoming 2017/18 season. 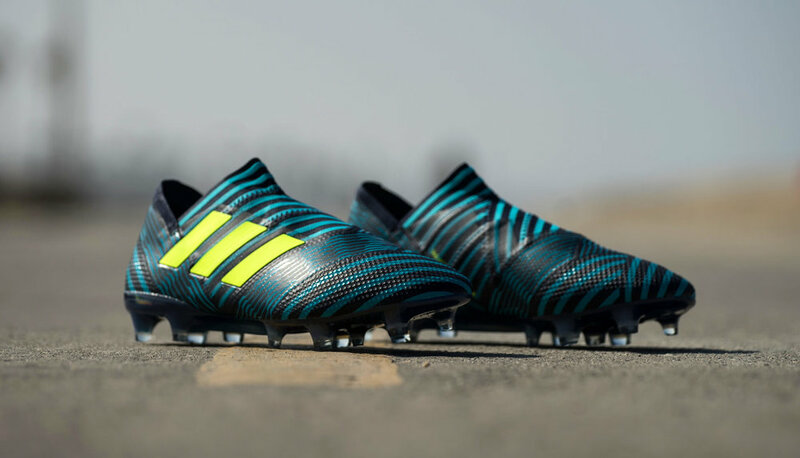 The Three Stripes jump on the good ship Nemeziz to ride a wave a momentum into the new campaign with a design that throws hues of blue onto the laceless silhouette. Pushing the Nemeziz 17+ 360 Agility out into the spotlight first, adidas give a leading role to their youngest silo before it's joined by a corresponding support cast in the coming days. The 'Ocean Storm' design is the first time adidas have brought their paint palettes into action, having launched the silo in black and white. Those trademark Agility Bandages getting their first opportunity to show off their versatility in colour, while proudly hosting the bold volt stripes. Here's your compulsory tech lowdown as we're still only on the second colourway: The key design feature of adidas Nemeziz 17+ 360 Agility takes inspiration from the process of taping, for increased stability and agility. Taping comes from a common ritual in ancient battle for both physical and mental strength (common in boxing, martial arts, etc). Each element of Nemeziz has be designed to suit players whose agility helps them succeed on pitch, by delivering security, support and adaptability. First up you've got a unique AGILITYBANDAGE that features TORSIONTAPES technology to keep the foot locked down and deliver ultimate fit, whilst a dual-lock collar secures the ankle in place to enable that explosive change of direction. Next up there's the TORSIONFRAME outsole that features an ultra-lightweight construction and TORSIONRIBS to provide dynamic push off support; a key feature for agile movement. The new AGILITYKNIT 2.0 interlocking yarn structure provides a soft direct touch and a lightweight adaptable feel. The adidas Nemeziz 17+ 360 Agility 'Ocean Storm' will be joined by in-line designs of the ACE 17+ Purecontrol, X 17+ Purespeed and COPA 17.1 in the coming days as adidas complete their first on-pitch collection for their players to kick off the 2017/18 season in – taking over from the 'Dust Storm' Pack. For the Nemeziz, that means you can expect to see the likes of Roberto Firmino, Julian Draxler, Jesse Lingard and Renato Sanches wearing the 'Ocean Storm' colourway from this weekend onwards.